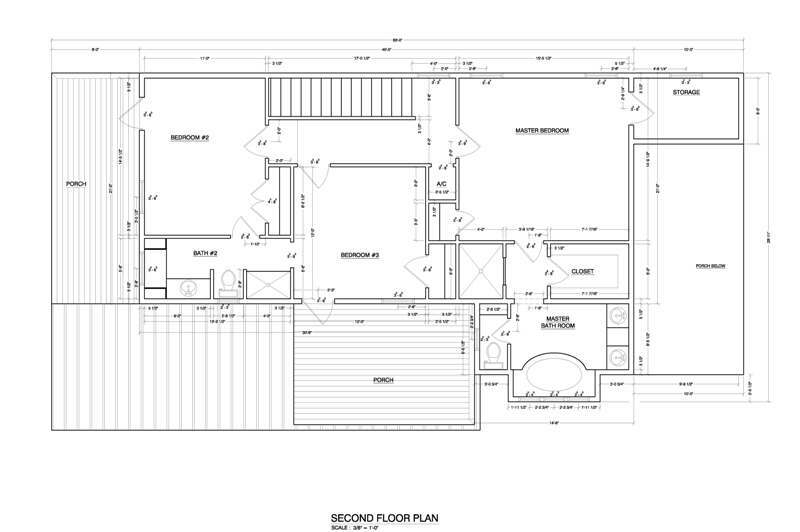 Beach house plans: Learn what the vital components of beach house plans are. Looking for the Best Beach House Plans? How well can the house stand up to Mother Nature? Beachfront land is a beautiful gem, but it also is exposed to the sometimes brutal energy of Mother Nature. So, it needs to be built and designed accordingly. #1: The Construction Method. Your most important choice is the construction method. Although many beach home plans use typical frame (or "stick-built") construction, this is not the wisest choice. Plans that use concrete construction are your best option. Concrete will also save you MAJOR money in homeowner's insurance, which continues to rise each year. #2: Roof Design. Beachfront homes get exposed to the highest winds as compared to in-land properties. A hip roof, which leaves few areas where the wind can get under the roof, is a wise choice. Single-story beach house plans will also stand up better to the wind than two-story homes because their roof lines are lower to the ground. #3: Windows and Door Glass. In most beach and coastal areas, a special type of glass is required. It's called "impact resistant" glass, and it's meant to do exactly what its name suggests...that is, stand up to the impact of high winds and airborne debris. However, this type of window and door glass can be very expensive. So, when designing your beach house plans, choose your window placement carefully, and according to your budget. Most people with beachfront or coastal property want the majority of their windows and glass doors to face the water to enjoy the views. That certainly makes sense, but consider the practicality of this choice, too. That is also the direction the high winds will come. So, having an overabundance of windows and glass doors on the beachfront side of your house will make your house more vulnerable to destruction by high winds. It's a delicate balance to strike between design aesthetics and practicality. #4: Exterior Finishing Materials. If your beachfront land is on the ocean, remember that salt water is especially corrosive, so choose exterior materials that can stand up to this. For example, fiberglass exterior doors are usually a better choice than steel doors. Exterior lighting fixtures should be made of stainless steel or plastic. 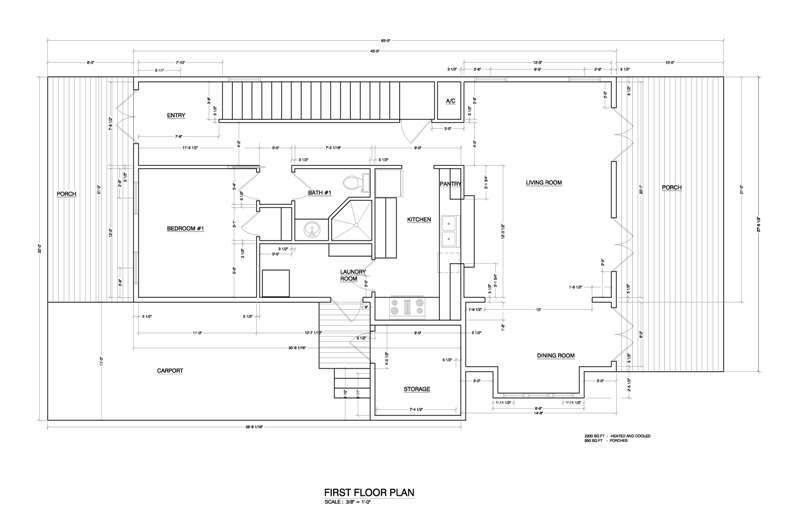 Your wisest choice of house plans is one that is designed with concrete. You can choose either concrete block or ICF (insulating concrete forms)...either is a better choice for beach home plans than stick-built construction. However, a beachfront home built using ICF forms will have the added benefits of energy efficiency and strength over a home built with concrete blocks. Following is a plan that one of the designers in our directory created for a coastal barrier zone on the Gulf Coast in Florida...this area is otherwise known as "Hurricane Alley." 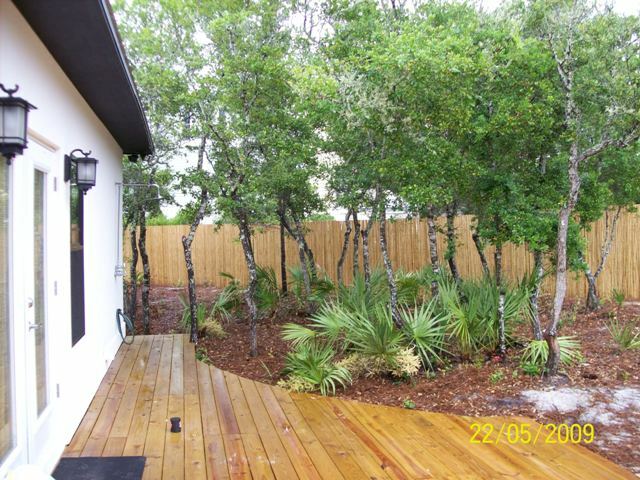 It is designed per the Miami-Dade code, which is one of the strictest building codes in the country. Although the owner's lot is not beachfront, it is only a hundred feet or so from the water. If you'd like to learn more about how this home, and other homes, would stand up to hurricanes, click here. 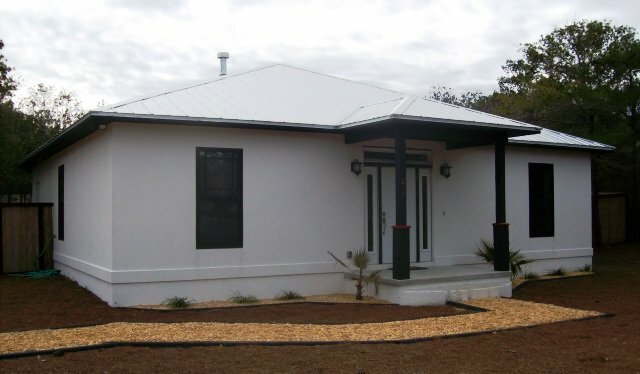 View more photos of this hurricane and termite-resistant concrete (ICF) home here. 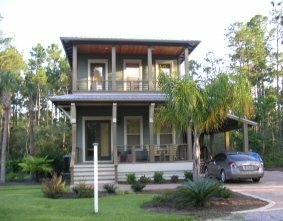 Following is another plan that another of the designers in our directory created for a lot that is about 2 miles from the Gulf coast. Although it is not built with ICF, it is designed and engineered to withstand coastal wind loads (per the coastal barrier zone code). Impact glass windows and doors were installed throughout, also. This is a classic cottage-style home that fits well into any neighborhood. It's especially well suited for narrow lots. or to inquire about their design services. 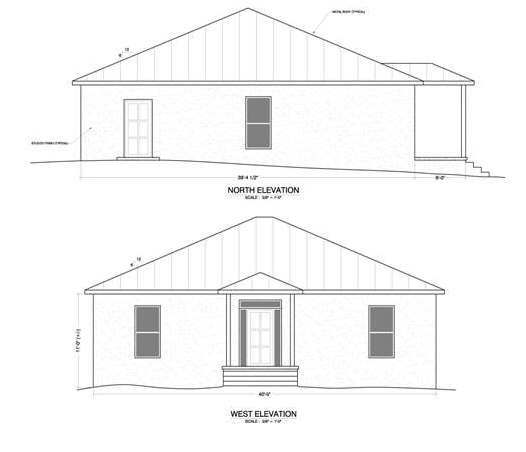 If you'd like to learn more about hurricane proof house plans, click here. 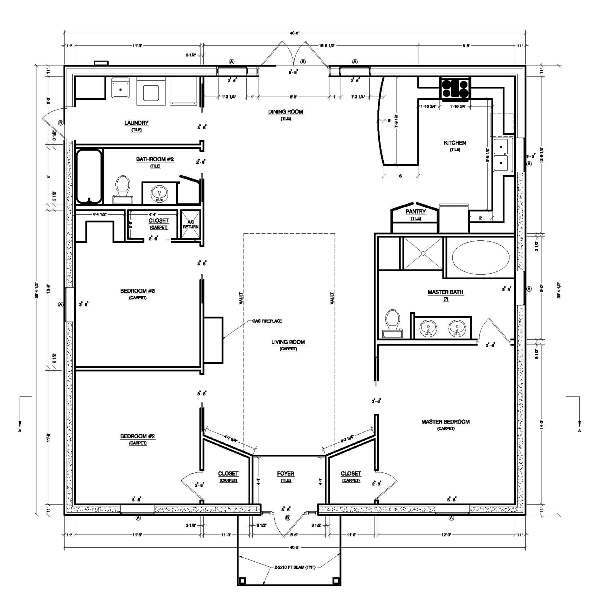 And here's more information about beach house floor plans. Return to the House Plans Catalog page from Beach Houses. Return from Beach House Plans to the Home Page.